Measures of spatial distribution of deprivation have been developed and used in Northern Ireland since the 1970s, and have played a central role in terms of informing the targeting of resources to the most deprived areas in Northern Ireland. 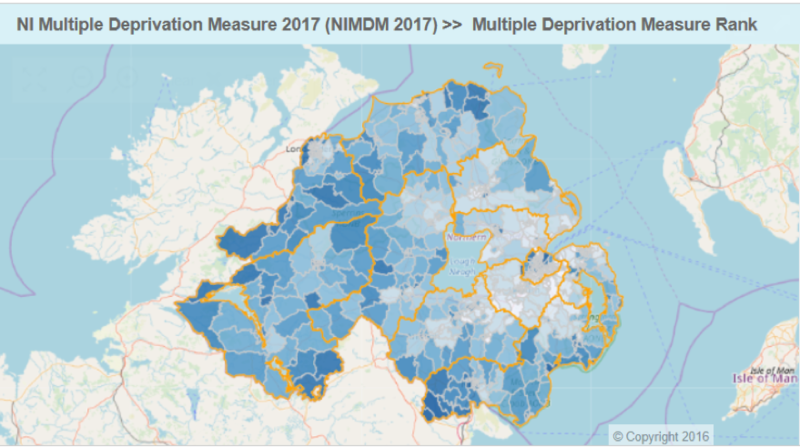 In November 2017 the Northern Ireland Statistics and Research Agency (NISRA) published the Northern Ireland Multiple Deprivation Measure (NIMDM) 20171. NIMDM 2017 is constructed from 38 different indicators relating to 7 types or ‘domains’ of deprivation: Income Deprivation, Employment Deprivation, Health Deprivation and Disability, Education, Skills and Training Deprivation, Access to Services, Living Environment and Crime & Disorder. Northern Ireland is split into 890 spatial areas known as Super Output Areas (SOAs), with an average population of around 2,100 people. The indicators in each domain were analysed to produce a domain specific deprivation ranking of the 890 SOAs in Northern Ireland, from 1 (most deprived) to 890 (least deprived). The ranks of the 7 domains were weighted and combined, to provide a ranking of multiple deprivation (MDM) for the 890 SOAs. Where are the 100 most deprived SOAs according to the Multiple Deprivation Measure? In April 2018 NISRA released deprivation statistics for Small Areas2. These allow the identification of smaller pockets of deprivation than the results for Super Output Areas. On average, each Super Output Area can be split into 5 Small Areas. Identify clusters of similarly deprived Small Areas that cross Super Output Area boundaries. The MDM is frequently used in projects carried out through the Honest Broker Service. Linkage is done at patient level by mapping the patient postcode to a Super OutputArea using the Central Postcode Directory. The patient postcode is then removed from the dataset as it is a potential identifier. The number of patients in each SOA are considered and if necessary the raw MDM ranking is replaced by a decile or quintile band e.g. decile 1 = most deprived 10% of SOAs i.e. those ranked 1-89. Similarly quintile 1 = most deprived 20% of SOAs i.e. those ranked 1-178. This allows researchers to factor in to any analysis and modelling work whether or not a subject resides in a more deprived area, and if this is of any significance to health outcomes. 15 recommendations3 were made following NIMDM 2017. One of relevance to this NI MIDAS pilot was to consider the creation of a child specific multiple deprivation measure. A focus group met in June 2018 to consider this suggestion, and although it was agreed that there was no urgent need, this will be kept under review.